Is anyone else thinking of that song by Erasure called Chains of Love? I loved that song when I was a teen! 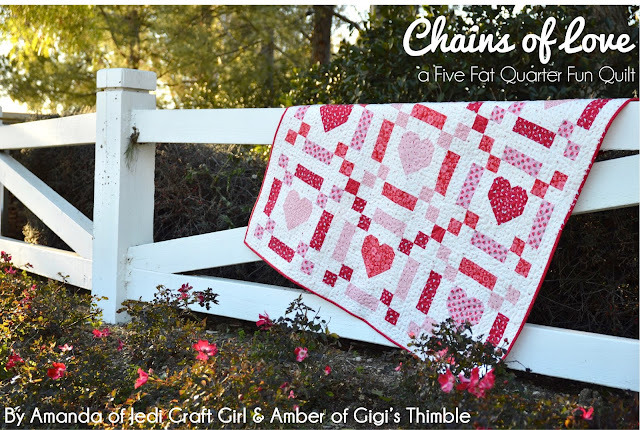 And I love this pattern that my friend Amanda of the blog Jedi Craft Girl designed for our Five Fat Quarter Fun series! 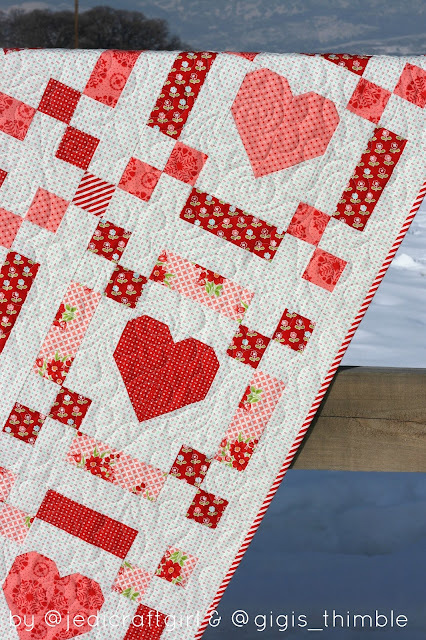 This FREE pattern is a fun make for this month - or anytime of year! 2 yards of background fabric to finish the top! These blocks are super easy and fun to make! The quilt finishes at 51" x 51" - the perfect lap size quilt. I've been snuggling with it the last few days whenever I feel cold and it has me feeling super festive for February! If you're following me on Instagram you may have saw my post last week about me getting ready to machine quilt this thing myself. And then, guess what!?! I chickened out!!! I haven't done much free motion quilting before and didn't have time to perfect my skills and get it done in time so I decided to make one last ditch effort to find a quilter that could do a super quick turnaround. My friend and neighbor Melinda Raven just happened to be available! I dropped the quilt off to her on Saturday and she got it back to me a few hours later. I couldn't believe it! I love the sweet floral/heart design she did. It's not quite as dense as I usually do and I like how soft it keeps the quilt feeling! 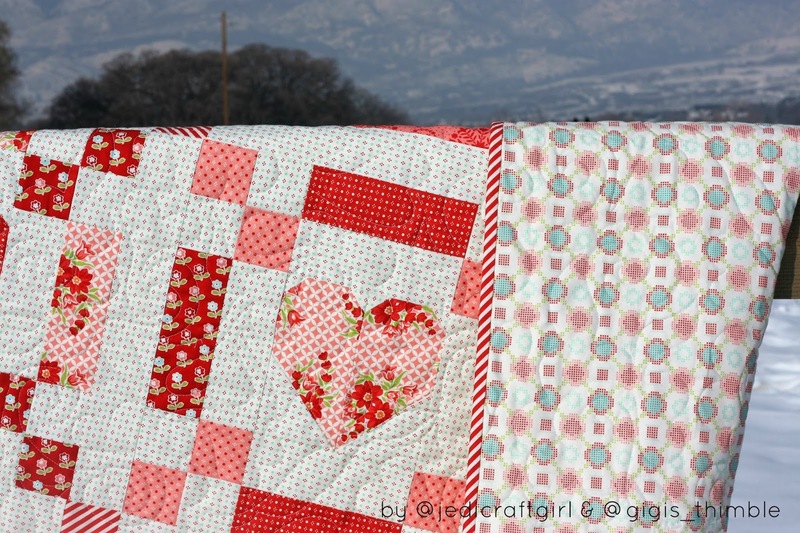 Be sure to stop by Amanda's blog HERE to see more photos of her fabulous quilt and get the FREE PDF pattern! We are having fun (and quilting like crazy! :) to bring you one of these FREE patterns each and every month! Are you sewing along with us? 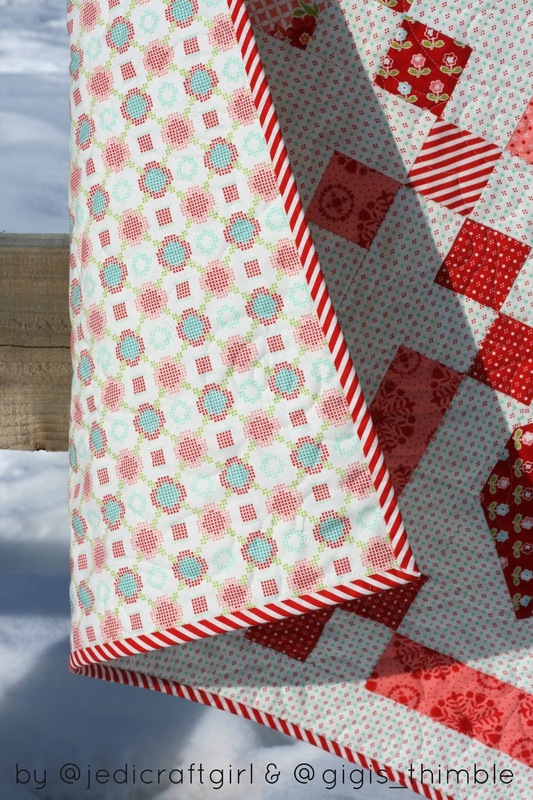 We hope you'll join us in making all the Five Fat Quarter Fun projects! It's a great way to use up your stash and make a small quilt each month! Be sure to tag us on Instagram if you're sewing along with us! Amanda is @jedicraftgirl and I'm Amber @gigis_thimble. Don't forget to use the hashtag #fivefatquarterfun. This is absolutely gorgeous!! 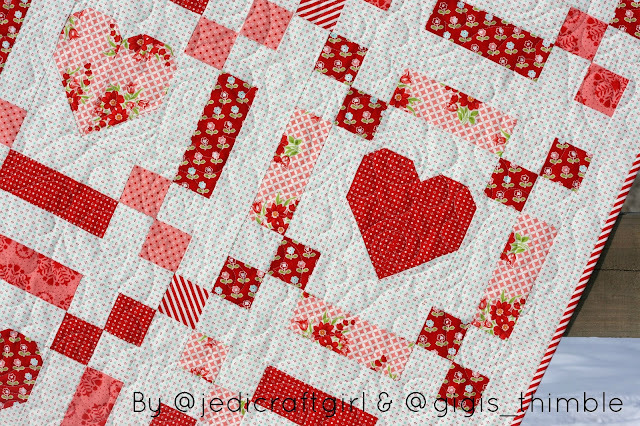 Wish I had a neighbor so close to quilt my quilts :)!! She did a beautiful job! This quilt is absolutely adorable! I love your fabric choices! I love your quilt! Thank you so much for sharing. I just love this quilt. 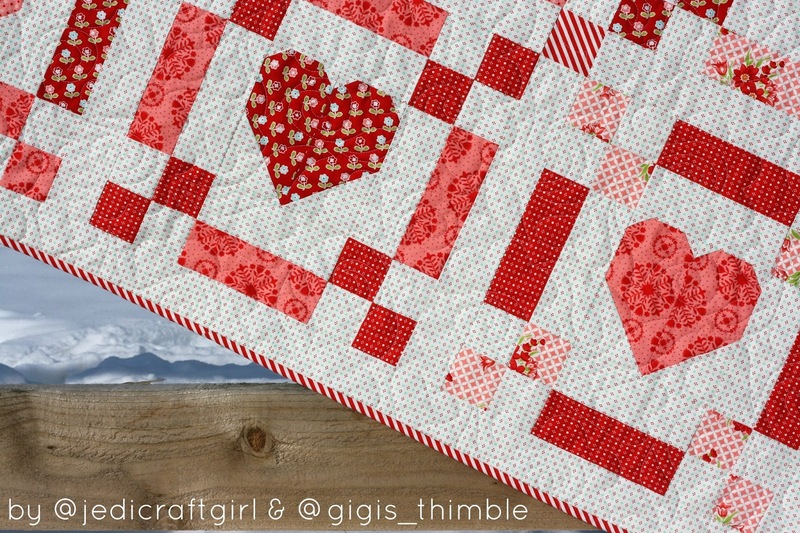 I have been wanting to do a Valentine's Day quilt forever! This one will be perfect. Thank you so much for sharing your pattern! 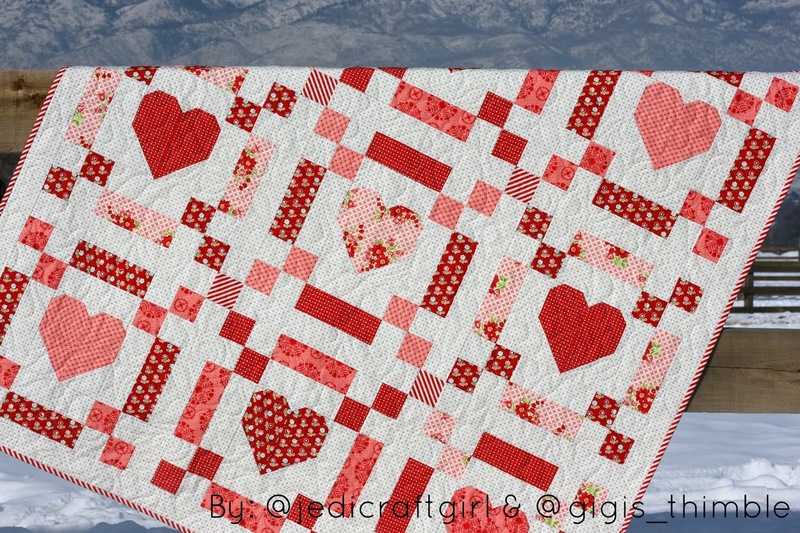 This is a perfect quilt for February. I'm loving the idea of the 5 fat quarter quilts. Thanks for sharing! Beautiful Quilt. I need to make this one.